Event display of a candidate tttt event with one of the top quark candidates producing a jet originating from a b quark (b jet), a muon and a neutrino (that the CMS experiment cannot directly detect). The additional jets could come from the other three top quarks. 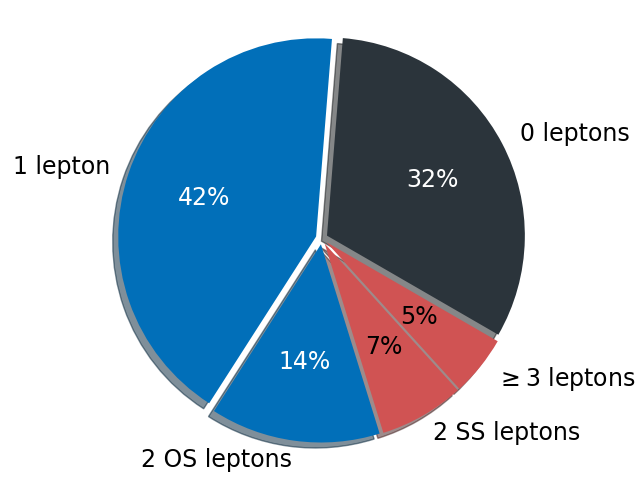 Fraction of tttt events resulting in 0, 1, 2 or at least 3 leptons. Collisions with 2 leptons are divided according to the electric charge of the particles: cases when the particles have opposite charge (OS) or same charge (SS). Physicists at the CMS experiment are now very close to observing the simultaneous production of four top quarks (really two top quarks and two antitop quarks, but particle physicists describe this process as tttt) at the Large Hadron Collider for the first time. The CMS collaboration recently provided preliminary results for two new analyses that have searched for this elusive process, studying up to three years of data and using different signatures. They have reached significance of up to 2.6 standard deviations, almost the ‘3 sigma' threshold that is commonly agreed to claim evidence for a new process. By setting stringent upper bounds on the amount of four top quark production, they have also ruled out several new physics scenarios and is sensitive to unexpected properties of the Higgs boson, as well as possible new Higgs-like bosons. One of the main goals of the CMS experiment at the LHC is to challenge theoretical predictions based on fundamental laws of nature, summarised in a theoretical framework called the standard model. A deviation from the predictions of the standard model, observed in high-energy proton-proton collisions may be an indication of even more basic principles that govern interactions of elementary particles at microscopic scales. The top quark is the most massive elementary particle that we know, with a mass close to that of the Tungsten atom. Due to its large mass, the top quark has the strongest interaction with the Higgs boson. Therefore, studying events with four top quarks can provide a fascinating insight into properties of the Higgs boson. On the other hand, owing to the large mass of the top quark, the proton-proton collisions resulting in four top quarks are incredibly uncommon. In fact, out of the quadrillion collisions in the past three years, only 1500 four top events are waiting to be found! Nevertheless, potential extensions of the standard model predict significantly higher production rates, especially if new exotic particles coupling to top quarks exist. Top quarks are unstable, so they decay so quickly that they cannot be seen directly by a particle physics detector. 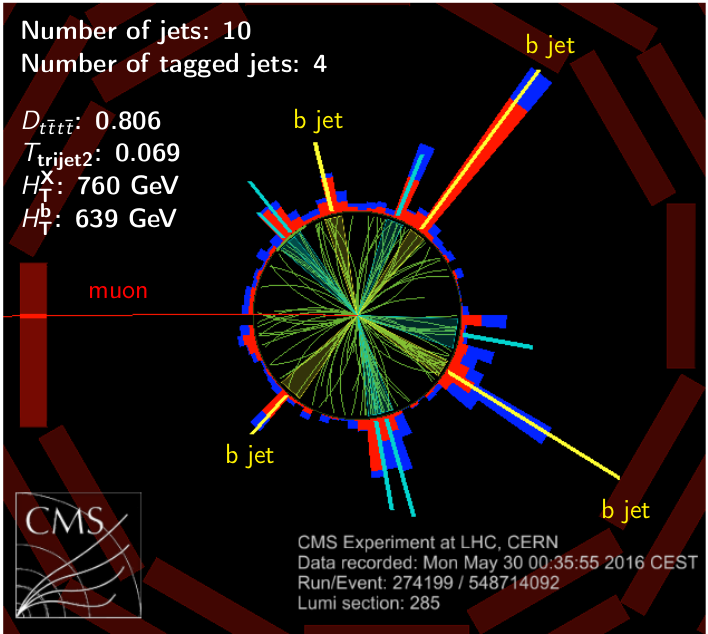 Similar to the way we observe the Higgs boson, what we observe in the CMS experiment are the decay products of the top quarks: isolated leptons (we use electrons or muons) as well as particle showers generated by quarks, which we call jets. When producing four top quarks simultaneously, it is possible to classify the decays in terms of the number of leptons, and their electrical charge, as shown in Figure 1. The CMS collaboration has investigated two ways to examine collisions looking for four top events with complementary approaches. The first focuses on the blue slices of the pie; events with one lepton, or two leptons of opposite charge. The other focused on the red slices of the pie; events with two leptons of the same charge, or at least 3 leptons. The first approach collects a more substantial fraction of tttt events but suffers from an overwhelming background from top quark pair production, a process almost one hundred thousand times more frequent than tttt. The second approach collects a smaller fraction of tttt events but does not include much background from top quark pair events, which means the primary backgrounds are rare processes that the LHC has only recently measured for the first time, like top quark pairs produced simultaneously with a W, Z, or Higgs boson. Together, the two approaches cover two-thirds of the tttt pie. To be able to distinguish the rare collisions that create four top quarks from much more abundant background processes, machine learning algorithms were employed. Using information such as particles energies and directions, the decay products of top quarks can be distinguished using algorithms that measure at the difference between the signal and background collisions. Figure 2 shows an LHC collision that was classified as likely to have resulted in four top quarks. Figure 2: Event display of a candidate tttt event with one of the top quark candidates producing a jet originating from a b quark (b jet), a muon and a neutrino (that the CMS experiment cannot directly detect). The additional jets could come from the other three top quarks. The events in the blue slice are studied in the dataset collected by CMS in 2016. Without any indications of deviation from the predictions of the standard model, constraints on a broad class of new physics scenarios were obtained after combining the results with those of the corresponding red slices for the same year. The combination of both searches with the 2016 data measured the production rate of tttt with a nearly 100% uncertainty, resulting in a statistical significance of 1.4 sigma. Additionally, the events in the red slices were analysed for two more years worth of CMS data, 2017 and 2018, and resulted in improved uncertainties on the tttt measurement (40%), corresponding to a statistical significance of 2.6 sigma. In other words, if the data consisted of purely background collisions, the probability of the data to accidentally look like it contained the tttt process is now less than 0.5%! In particle physics, there are potential connections between different processes and particles, and this means that these new results can be interpreted in several ways. First, particle physicists can study how tttt results can place constraints on new interactions within a framework called Effective Field Theory. In addition, changes to the rate of tttt collisions can be connected to the strength of the interaction between the top quark and the Higgs boson. Finally, this tttt result can be used to make a statement about other Higgs-like bosons which, if they existed, would affect the rate of tttt events at the LHC.